Saturday 29th September saw a happy band of volunteers giving the Woodland Trail its Autumn tidy up. Helping the adults were five children. 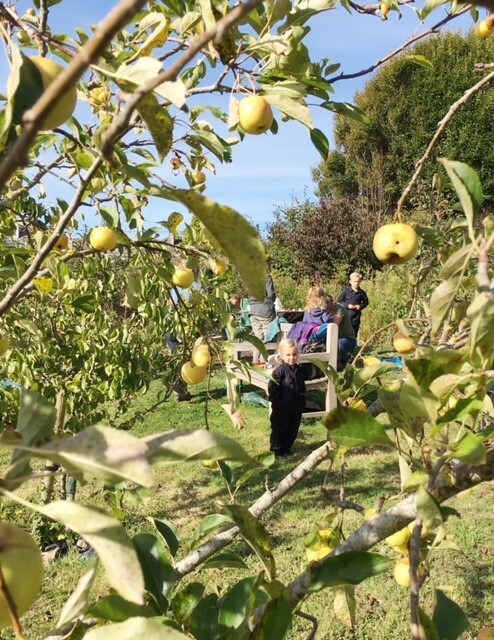 Everyone has a lovely sunny morning and enjoyed tasting the different varieties of apple which have grown in our community orchard. This was the first proper crop since the trees were planted two years ago. Pre-School went and had a taste on Monday and compared colours, shape and size. If you haven’t yet paid the orchard a visit, do go and explore and try an apple or two ! For further information about Friends of the Woodland Trail or to volunteer, please contact Sue Spilling on 01929 426699, suspgy@gmail.com or the Parish Clerk.